In a world where villainy is common place, someone has stolen the pyramids and replaced them with inflatable replicas. Gru, a villain whose dark creepy home is situated amidst a typical suburban neighborhood, is vexed that his villain brotherhood thinks that he did it. So he comes up with a plot that will out do the pyramid heist. He will steal the moon! Gru (Steve Carrell) has a secret underground lair filled with minions to do his bidding Minions are small one or two eyed little creatures that help Gru and his assistant Dr. Narfario (Russell Brand) carry out their plots and crimes. Gru seems to know them all by name. One day a trio of little girls comes to the door trying to sell cookies. They are set up by their cruel orphanage matron Miss Hattie (Kristen Wiig) to make money from their labors. He sends them away as he plots to steal a Chinese shrink ray. Unfortunately he needs money to build the rocket to take it close to the moon to shrink it. The bank turns down the loan, but not before learning of his plan. The news is leaked to Vector (Jason Segal) who had actually stolen the pyramids so that he can steal the shrinking ray and share the ransom with the bank (who is run by Vector’s father). Vector steals the shrinking ray from Gru. When Gru attempts to steal it back he stymied by Vector’s protective devices that surround his house. He notices the little orphan girls are easily let it to sell their cookies there, so Gru adopts them in order to use the girls as a way in. Margo, Edith and Agnes (Miranda Cosgrove, Dana Gaier, and Elsie Fisher) are so grateful to finally have a home they overlook Gru’s wickedness and give him unconditional love. Even Gru’s mother (Julie Andrews) is not immune to the girls’ charms. Gru is determined to complete his moon heist, fight off Vector’s plans to usurp his crime and make it to the girls’ dance recital. Animators Pierre Coffin and Chris Renaud directed this 3D feature that was written by Ken Daurio and Cinco Paul from a story by Sergio Pablos. 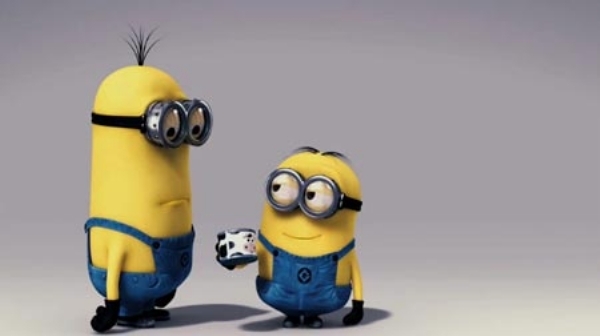 The dialogue at times may go over the heads of the younger audience but they will appreciate the cute and loveable minions and the plucky little girls who get Gru to read them stories. As in most animated movies, the bad guys are usually the most interesting, and in this case they are the lead characters. Despite all the crazy improbable crimes they are not all totally evil like the apple bearing queen in Snow White. Kids will not feel threatened or go home wanting to steal shrink rays. The 3D didn’t really do much except for the roller coaster scene, but it was not as annoying as most features as of late. The main humor will be enjoyed by the parents and their “minions” will enjoy the action and highly colored visuals that will give Pixar some competition this summer.